To truly understand the Republican tax plans now winding their way through Congress, one must look at the specifics of what is being proposed. And the more closely one looks, the more appalling these plans are seen to be. The blatant greed is breathtaking. Despite repeatedly asserting that the plans would provide tax cuts for the middle class, the specific proposals now before Congress would in fact do the opposite. Figures will be provided below. And while the Secretary of the Treasury has repeatedly stated that only millionaires will pay more in taxes, the specific proposals now before Congress would in fact give millionaires huge cuts in the taxes they owe. While provisions in the plans are changing daily, with certain differences between the versions being considered in the House and in the Senate as well as between these and what the White House set out in late September, the overall framework has remained the same (as the proponents themselves are emphasizing). And this really is a Republican plan. The House version was passed on a largely party-line vote with no Democrats in favor and only a small number of Republicans opposed, and the Senate version will require (assuming all Democrats vote against as they have been shut out of the process) 50 of the 52 Republican Senators (96%) to vote in favor. The Republican leadership could have chosen to work with Democrats to develop a proposal that could receive at least some Democratic support, but decided not to. Indeed, while their plans have been developed by a small group since Trump assumed the presidency in January, the specifics were kept secret as long as possible. This made it impossible (deliberately) for there to be any independent analysis. They are now trying to rush this through the House and the Senate, with votes taken as quickly as possible before the public (and the legislators themselves) can assess what is being voted upon. The committees responsible for the legislation have not even held any hearings with independent experts. And the Congressional Budget Office has said it will be unable to produce the analysis of the impacts normally required for such legislation, due to the compression of the schedule. Fortunately, the staff of the Joint Committee on Taxation (JCT, a joint committee of both the House and the Senate) have been able to provide limited assessments of the legislation, focused on the budgetary and distributional impacts, as they are minimally required to do. This blog post will use their most recent analysis (as I write this) of the current version of the Senate bill to look at who would be gaining and who would be losing, if this plan is approved. As a first step, however, it would be good to address the claim that these Republican tax plans will spur such a jump in economic growth that they will pay for themselves. This will not happen. First, as earlier posts on this blog have discussed, there is no evidence from the historical data to support this. Taxes, both on individuals and at the corporate level, have been cut sharply in the US since Reagan was president, and they have not led to higher growth. All they did was add to the deficit. Nor does one see this in the long-term data. The highest individual income tax rates were at 91 or 92% (at just the federal level) between 1951 and 1963, and at 70% or more up until 1980. The highest corporate income tax rate was 52% between 1952 and 1963, and then 46% or more up until 1986. Yet the economy performed better in these decades than it has since. The White House is also claiming that the proposed cut in corporate income taxes will lead to a rise in real wages of $4,000 to $9,000. But there is no evidence in the historical data to support such a claim, which many economists have rejected as just absurd. Corporate income tax rates were cut sharply in 1986, under Reagan, but real wages did not then rise – they in fact fell. Finally, the assertion that tax cuts will lead to a large jump in growth ignores that the economy is already at full employment. Were there to be an incipient rise in growth, leading to employment gains, the Federal Reserve Board would have to raise interest rates to keep the economy from over-heating. The higher interest rates would deter investment, and one would instead have a shift in shares of GDP away from investment and towards consumption and/or government spending. Any impact on growth would thus be modest at best. The Tax Policy Center, using generous assumptions, estimated the tax plan might increase GDP by a total of 0.3% in 2027 and by 0.2% in 2037 over what it would otherwise then be. An increase of 0.2% over 20 years means an increase in the rate of growth of an average of just 0.01% a year. GDP figures are not even measured to that precision. There would, however, be large distributional effects, with some groups gaining and some losing simply from the tax changes alone (and ignoring, for the purposes here, the further effects from a higher government debt plus increased pressures to cut back on government programs). This blog post will discuss these, from calculations that draw on the JCT estimates of the revenue and distributional impacts. The distributional consequences of the proposed changes in tax law depend on which separate taxes are to be cut or increased, what changes are made to arrive at what is considered “taxable income” (deductions, exemptions, etc. ), and how those various taxes impact different individuals differently. Thus one should first look at the changes proposed for the various taxes, and what impacts they will have on revenues collected. The JCT provides such estimates, at a rather detailed level as well as year by year to FY2027. The JCT estimates for the tax plan being considered in the Senate as of November 16 is available here. Estimates are provided of the impacts of over 144 individual changes, for both income taxes on individuals and on various types of business (corporate and other). A verbal description from the JCT of the Senate chair’s initial proposal is available here, and a description of the most recent changes in the proposal (as of November 14) is available here. I would encourage everyone to look at the JCT estimates to get a sense of what is being proposed. It is far more than what one commonly sees in the press, with many changes (individually often small in terms of revenue impact) that can only be viewed as catering to various special interests. Source: Calculated from estimated tax revenue effects made by the staff of the Joint Committee on Taxation, publication JCX-59-17, November 17, 2017, of the November 16 version of the Republican Chairman’s proposed tax legislation. As the chart and table show, while overall tax revenues would fall by an estimated $1.4 trillion over FY18-27 (excluding interest on the resulting higher public debt), not everyone would be getting a cut. Proposed changes that would primarily benefit rich individuals (doubling the Estate Tax exemption amount to $22 million for a married couple, repealing the Alternative Minimum Tax in full, and taxing pass-through business income at lower rates than other income) would reduce the taxes the rich owe under these provisions by close to $1.1 trillion. But individual income taxes excluding these three categories would in fact increase, by an estimated $191 billion over the ten years. This increase of $191 billion in income taxes that most affect the middle and lower income classes, is not a consequence of an explicit proposal to raise their taxes. That would be too embarrassing. Rather, it is the net result of numerous individual measures, some of which would reduce tax liability (and which the politicians then emphasize) while others would increase tax liabilities (and are less discussed). Cuts totaling $2.5 trillion would come primarily from reducing tax rates, from what they refer to as a “doubling” of the standard deduction (in fact it would be an increase of 89% over the 2017 level), and from increased child credits. But there would also be increases totaling close to $2.7 trillion, primarily from eliminating the personal exemption, from the repeal of or limitation on a number of deductions one can itemize, and from changes that would effectively reduce enrollment in the health insurance market. Part of the reason for this net tax increase over the full ten years is the decision to try to hide the full cost of the tax plan by making most of the individual income tax provisions (although not the key changes proposed for corporate taxes) formally temporary. Most would expire at the end of 2025. The Republican leadership advocating this say that they expect Congress later to make these permanent. But if so, then the true cost of the plan would be well more than the $1.5 trillion ceiling they have set under the long-term budget plan they pushed through Congress in September. Furthermore, it makes only a small difference if one calculates the impact over the first five years of the plan (FY18-22). There would then be a small net reduction in these individual income taxes (excluding Estate Tax, AMT, and Pass-Through) of just $57 billion. This is not large over a five year period – just 0.6% of individual income taxes expected to be generated over that period. Over this same period, the cuts in the Estate Tax, the AMT, and for Pass-Through income would total $535 billion, or well over nine times as much. One should also keep in mind that these figures are for overall amounts collected, and that the impact on individuals will vary widely. This is especially so when the net effect (an increase of close to $200 billion in the individual income taxes generated) is equal to the relatively small difference between the tax increases ($2.7 trillion in total) and tax cuts ($2.5 trillion). Depending on their individual circumstances, many individuals will be paying far more, and others far less. For example, much stress has been put on the “doubling” of the standard deduction. However, personal exemptions would also be eliminated, and in a household of just three, the loss of the personal exemptions ($4,050 per person in 2017) would more than offset the increase in the standard deduction (from $12,700 to a new level of $24,000). The change in what is allowed for the separate child credits will also matter, but many households will not qualify for the special child credits. And if one is in a household which itemizes their deductions, both before and after the changes and for whatever reason (such as for high medical expenses), the “doubling” of the standard deduction is not even relevant, while the elimination of the personal exemptions is. Taxes relevant to the rich would be slashed, however. Only estates valued at almost $22 million or more in 2017 (for a married couple after some standard legal measures have been taken, and half that for a single person) are currently subject to the Estate Tax, and these account for less than 0.2% of all estates. The poorer 99.8% do not need to worry about this tax. But the Senate Republican plan would narrow the estates subject to tax even further, by doubling the exemption amount. The Alternative Minimum Tax (AMT) is also a tax that only applies to relatively well-off households. It would be eliminated altogether. And pass-through income going to individuals is currently taxed at the same rates as ordinary income (such as on wages), at a rate of up to 39.6%. The current proposal (as of November 16) is to provide a special deduction for such income equal to 17.4%. This would in effect reduce the tax rate applicable to such income from, for example, 35% if it were regular income such as wages (the bracket when earnings are between $400,000 and $1.0 million in the current version of the plan) to just 28.9%. Pass-through income is income distributed from sole proprietorships, partnerships, and certain corporations (known as sub-chapter S corporations, by the section in the tax code). Entities may choose to organize themselves in this way in order to avoid corporate income tax. Those receiving such income are generally rich: It is estimated that 70% of such pass-through income in the US goes to the top 1% of earners. Such individuals may include, for example, the partners in many financial investment firms, lawyers and accountants, other professionals, as well as real estate entities. There are many revealing examples. According to a letter from Trump’s own tax lawyers, Trump receives most of his income from more than 500 such entities. And Jeff Bezos, now the richest person in the world, owns the Washington Post through such an entity (although here the question might be whether there is any income to be passed through). The JCT estimates are that $83 billion in revenue would be lost if the Estate Tax exemption is doubled, $769 billion would be lost due to a repeal of the AMT, and $225 billion would be lost as a result of the special 17.4% deduction for pass-through income. This sums to $1,077 billion over the ten years. Rich individuals thus will benefit greatly from the proposed changes. Taxes relevant just to them will be cut sharply. These taxes are of no relevance to the vast majority of Americans. With the proposal as it now stands, most Americans would instead end up paying more over the ten year period. And even if all the provisions with expiration dates (mostly in 2025) were instead extended for the full period, the difference would be small, with at best a minor cut on average. It would not come close to approaching the huge cuts the rich would enjoy. The proposed changes in taxes on business incomes are more numerous. They would also in general be made permanent (with some exceptions), rather than expire early as would be the case for most of the individual income tax provisions. There are also numerous special provisions, with no obvious explanation, which appear to be there purely to benefit certain special interests. To start, the net impact on domestic business activities would be a cut of an estimated $682 billion over the ten year period. The lower tax revenues result from cutting the tax rate on corporate profits from 35% to 20%, plus from the repeal of the corporate AMT. The cuts would total $1,370 billion. This would be partially offset by reducing or eliminating various deductions and other measures companies can take to reduce their taxable income (generating an estimated $826 billion over the period). However, there would also be measures that would cut business taxes even further (by an estimated $139 billion) on top of the impact from the lower tax rates (and elimination of the AMT). Most, although not all, of these would be a consequence of allowing full expensing, or accelerated depreciation in some cases, of investments being made (with such full expensing expiring, in most cases, in 2022). The objective would be to promote investment further. This is reasonable, but with full expensing of investments many question whether anything further is gained, in terms of investment expenses, from cutting the corporate rate to 20%. Special provisions include measures for the craft beer industry, which would reduce tax revenues by $4.2 billion. The rationale behind this is not fully clear, and it would expire in just two years, at the end of 2019. The measures should be made permanent if they are in fact warranted, but their early expiration suggests that they are not. Also odd is a provision to allow the film, TV, and theater industries to fully expense certain of their expenses. But this provision would expire in 2022. If warranted, it should be permanent. If not, it should probably not be there at all. There are a large number of such special provisions. Individually, their tax impact is small. Even together the impact is not large compared to the other measures being proposed. They mostly look like gifts to well-connected interests. Others lose out. These include provisions that allow companies to include as a cost certain employee benefits, such as for transportation, for certain employee meals (probably those provided in remote locations), and for some retirement savings provisions. Workers would likely lose from this. The proposal would also introduce new taxes on universities and other non-profits, including taxes on certain endowment income and on salaries of certain senior university officials (beyond what they already pay individually). The revenues raised would be tiny, and this looks more like a punitive measure aimed at universities than something justified as a “reform”. There would also be major changes in the taxes due on corporate profits earned abroad. Most importantly, US taxes would no longer be due on such activities. While this would cost in taxes a not small $314 billion (or $303 billion after a number of more minor cuts and increases are accounted for) over the ten years, also significant is the incentive this would create to relocate plants and other corporate activities to some foreign location where local taxes are low. There would be a strong incentive, for example, to relocate a plant to Mexico, say, if Mexico offered only a low tax on profits generated by that plant. The same plant in the US would pay corporate income taxes at the (proposed) 20% rate. How this incentive to relocate plant abroad could possibly be seen as a positive by politicians who say they favor domestic jobs is beyond me. It appears to be purely a response to special interests. The corporate tax cuts are then in part offset by a proposal to provide a partial amnesty on the accumulated profits now held overseas by US companies. Certain assets held overseas as retained earnings would be taxed at 5% and certain others at 10%. Under current US law, corporate profits earned overseas are only subject to US taxes (at the 35% rate currently, net of taxes already paid abroad in the countries where they operate) when those profits are repatriated to the US. As long as they are held overseas, they are not taxed by the US. An earlier partial amnesty on such profits, in 2004 during the Bush administration, led to the not unreasonable expectation that there would again be a partial amnesty on such taxes otherwise due when Republicans once again controlled congress and the presidency. This created a strong incentive to hold accumulated retained earnings overseas for as long as possible, and that is exactly what happened. Profits repatriated following the 2004 law were taxed at a rate of just 5.25%. The result is that US companies now hold abroad at least $2.6 trillion in earnings. And this $2.6 trillion estimate, commonly cited, is certainly an underestimate. It was calculated based on a review of the corporate financial disclosures of 322 of the Fortune 500 companies, for the 322 such companies where disclosures permitted an estimate to be made. Based also on the deductible foreign taxes that had been paid on such overseas retained earnings, the authors conservatively estimate that $767 billion in corporate income taxes would be due on the retained earnings held overseas by the 322 companies. But clearly it would be far higher, as the 322 companies, while among the larger US companies, are only a sub-set of all US companies with earnings held abroad. Thus to count the $185 billion (line D.4. in the table above) as a revenue-raising measure is a bit misleading. It is true that compared to doing nothing, where one would leave in place current US tax law which allows taxes on overseas profits to be avoided until repatriated, revenues would be raised under the partial amnesty if those accumulated overseas earnings are now taxed at 5 or 10%. But the partial amnesty also means that one will give up forever the taxes that would otherwise be due on the more than $2.6 trillion in earnings held overseas. Relative to that scenario, the amnesty would lead to a $582 billion loss in revenues (equal to an estimated $767 billion loss minus a gain of $185 billion from the 5 and 10% special rates of the amnesty; in fact the losses would be far greater as the $767 billion figure is just for the 322 companies which publish data on what they are holding abroad). This is, of course, a hypothetical, as it would require a change in law from what it is now. But it does give a sense of what is being potentially lost in revenues by providing such a partial amnesty. But even aside from this, one must also recognize that the estimated $185 billion gain in revenues over the next few years would be a one time gain. Once the amnesty is given, one has agreed to forego the tax revenues that would otherwise be due. It would help in reducing the cost of this tax plan over the next several years, but it would then lead to losses in taxes later. Finally, as is common among such tax plans, there is a promise to crack down on abuses, including in this case the use of tax havens to avoid corporate taxes. The estimate is that such actions and changes in law would raise $273 billion over the next ten years. But based on past experience, one must look at such estimates skeptically. The actual amounts raised have normally been far less. And one should expect that in particular now, given the underfunding of the IRS enforcement budget of recent years. The above examined what is being proposed for separate portions of the US tax system. These then translate into impacts on individuals by income level depending on how important those separate portions of the tax system are to those in each income group. While such estimates are based on highly detailed data drawn from millions of tax returns, there is still a good deal of modeling work that needs to be done, for example, to translate impacts on corporate taxes into what this means for individuals who receive income (dividends and capital gains) from their corporate ownership. The Tax Policy Center, an independent non-profit, provides such estimates, and their estimate of the impacts of the Republican tax plans (in this case the November 3 House version) has been discussed previously on this blog. The JCT also provides such estimates, using a fundamentally similar model in structure (but different in the particulars). 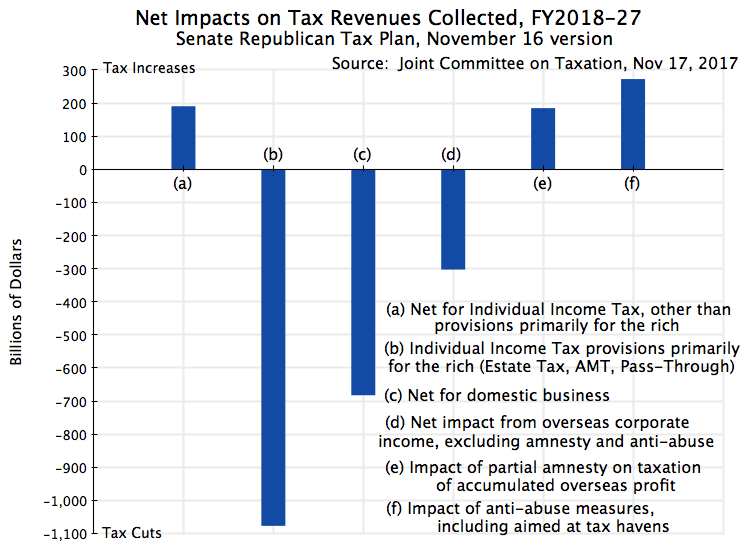 Source: Calculated from estimates of tax revenue distribution effects made by the staff of the Joint Committee on Taxation, publication JCX-58-17, November 16, 2017, of the November 15 version of the Republican Chairman’s proposed tax legislation. By these estimates, each income group would, on average, enjoy at least some cut in taxes in 2019. A number of the proposed tax measures are front-loaded, and it is likely that this structure is seen as beneficial by those seeking re-election in 2020. But the cuts in 2019 vary from tiny ($21 for those earning $10,000 or less, and $49 for those earning $10,000 to $20,000), to huge ($21,581 for those earning $500,000 to $1,000,000, and $58,864 for those earning over $1,000,000). However, from 2021 onwards, taxes due would actually rise for most of those earning $40,000 or less (or be cut by minor amounts). And this is already true well before the assumed termination of many of the individual income tax measures in 2025. With the plan as it now stands, in 2027 all those earning less than $75,000 would end up paying more in taxes (on average) under this supposed “middle-class tax cut” than they would if the law were left unchanged. The benefits to those earning over $500,000 would, however, remain large, although also declining over time. The tax plan now going through Congress would provide very large cuts for the rich. One can see this in the specific tax measures being proposed (with huge cuts in the portions of the tax system of most importance to the rich) and also in the direct estimates of the impacts by income group. There are in addition numerous measures in the tax plan of interest to narrow groups, that are difficult to rationalize other than that they reflect what politically influential groups want. The program, if adopted, would lead to a significantly less progressive tax system, and to a more complex one. There would be a new category of income (pass-through income) receiving a special low tax rate, and hence new incentives for those who are well off to re-organize their compensation system when they can so that the incomes they receive would count as pass-through incomes. While the law might try to set limits on these, past experience suggests that clever lawyers will soon find ways around such limits. There are also results one would think most politicians would not advocate, such as the incentive to relocate corporate factories and activities to overseas. They clearly do not understand the implications of what they have been and will be voting on. This is not surprising, given the decision to try to rush this through before a full analysis and debate will be possible. There have even been no hearings with independent experts at any of the committees. And there is the blatant misrepresentation, such as that this is a “middle-class tax cut”, and that “taxes on millionaires will not be cut”. If this is passed by Congress, in this way, there will hopefully be political consequences for those who chose nonetheless to vote for it. This entry was posted in Distribution of Income, Fiscal Issues and tagged policy, tax system, taxes by aneconomicsense. Bookmark the permalink.